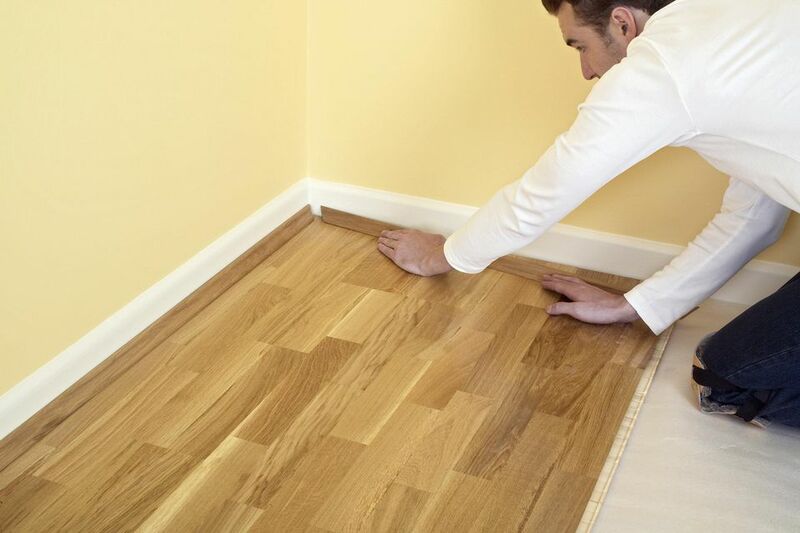 One factor to consider when shopping for flooring is thickness. Thicker flooring of any kind, whether it's solid hardwood, luxury vinyl, or engineered wood, means reduced sound migration, better insulating properties, softer footfalls, and better bridging of subfloor imperfections. Thickness is particularly important in the world of laminate flooring because laminate is inherently thin. The quest for thicker laminate flooring is a battle won in tiny increments: millimeters, to be exact. This is why 12 millimeter (mm) laminate flooring is so highly sought after. And while 12 mm laminate is not the absolute thickest laminate you can buy, it is the thickest you can reasonably find in most retail markets at a fair price. In most cases, this is the type of laminate you should consider if you're going for better-quality flooring. The 12 millimeter (mm) measurement refers to the thickness of the planks. To visualize this, imagine the thickness of a U.S. penny. A stack of 8 pennies is just a hair thicker than 12 mm. Another way to look at 12 mm laminate is that it is about twice as thick as the rock-bottom cheap laminates that you buy for less than $1.00 per square foot. Keep in mind that this measurement does not include the thickness of any underlayment. Underlayment is the optional foam padding under the laminate planks. With some brands, such as Pergo Accolade, underlayment comes pre-attached. One often confusing measurement listed in laminate flooring specifications is mils. A mil is one-thousandth of an inch and it refers to the extremely thin top photographic and wear layers of the flooring. For reference, heavy-duty plastic sheeting, such as you might use as landscape weed barrier or to protect a floor from painting or construction work, is 6 mils thick. Thicker laminate is one of those no-brainer purchases, if money is no object. If you do have the extra money to spend and your floor can take the slightly increased overall height, there is no reason not to buy it. Because laminate flooring is so bad at absorbing both footfalls and ambient sound within a room, every little extra bit of thickness helps. It has nothing to do with wear quality, since the thickness of the wear layer on the 12 mm laminate is the same as that on many thinner laminates. Thicker base material means improved impact-resistance. Sharp items and small appliances, for instance, that accidentally drop on 12 mm will have little effect on it. While thicker laminate typically does not have a thicker wear layer, it does allow for deeper embossing. Embossing is the secret sauce that gives premium laminates their swanky good looks. Deep embossing means that wood grains and stone textures actually have some depth and can create shadow. In addition to its higher cost, the only major downside to 12 mm laminate is that thicker flooring can create problems when transitioning to other types of flooring or when integrating with door, radiators, heating vents, and trimwork. Just be sure to check this out before buying thicker flooring.